Why are the brethren called “holy”? Are you holy? What is our heavenly calling? Why is Jesus referred to as the Apostle? What does apostle mean? Why is He referred to as a High Priest? What things did He and does He do as a Priest? Who appointed Him (from verse 2)? What comparisons and contrasts are made between Jesus and Moses? Why did the author compare these two figures? Explain verse 6. What does it mean that we are part of the house of Christ? What signs will show whether or not we are really part of His house? Philippians 3:14 – Our heavenly calling. Acts 3:22 – Moses said that God would raise up a prophet like him and the people should listen to him. Ephesians 2:22 – We are being built up together into the dwelling of God. 1 Timothy 3:15 – We are the household of God. 1. Holy brethren – God has called all believers to be holy. In 1 Peter 3:15 we learn that we are called to be holy as God is holy. This is God’s plan for us. He desires us to be 100% holy all the time. On this earth because of our old sinful flesh we struggle for this holiness. Paul himself was in a constant tug of war between sin and righteousness (Romans 7). Holiness basically means to be separate (see Leviticus 20:26). We are called to be separate from the world and from sin. That mean we are to be different. Are you different? Can people notice something different or even “weird” about you? If not, that is probably because you are not different and have not separated yourself from the world’s ways as you should. Though we are in a constant struggle for holiness, it is something that we cannot achieve on this earth. Through the process of santification and consciously putting off and repenting of our sin, we can get nearer this target, but will never reach it until we face God and He finally wipes away all our sin. Yet the author still calls believers holy. Why? In God’s sight that is what we are. When God looks at us, He sees not our own sins, but the righteousness of Christ who swapped Himself for us. This is something like the love of a parent, who always looks at the positive side of his children and not the weaknesses. Only in our case Christ actually replaces our sins and clothes us with His righteousness. Knowing that God looks at you as holy, how should you respond? 3. Apostle – An apostle means “sent one”. Jesus was sent by the Father as He Himself attested to many times. 4. High Priest – A major theme of chapters 4-10 will be Jesus as our High Priest. Here and at the end of chapter 2, the author alludes to this, but doesn’t go into it in detail. We also will save a detailed examination of it until those chapters. A priest is someone who goes in between people and God, like a mediator. Jesus performed this task, bridging the gap between us and God. 5. Jesus is superior to Moses. 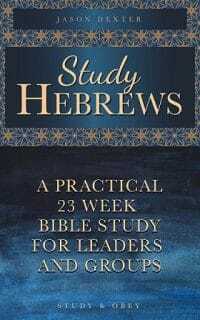 Remember from chapter 1 that a major theme of Hebrews is Jesus superiority and pre-eminence. The writer spent much of chapters 1-2 proving that Jesus is superior to the angles. Now in verses 1-6, he shows that Jesus is superior Moses. How did the Jews view Moses? Moses was the most respected figure in all of Jewish history (it is interesting to note however that he was not nearly so popular while he was alive). It was through Moses that God freed His people from Egypt. It was through Moses that God performed many awesome wonders that became known around the world. It was through Moses that He gave the people the Ten Commandments and the entire Torah (the first 5 books of the Bible). Moses was raised up so high in Jewish culture that it was actually a problem where people were almost becoming followers of Moses instead of followers of God. By showing that Jesus was superior to Moses, the author could show that He is indeed the Messiah that is worthy their praise and obedience. He gives several comparisons and contrasts between Jesus and Moses. A. Jesus and Moses were both faithful to do all of the tasks that God gave them. B. Jesus should receive more glory because He built the house (God’s kingdom), while Moses was a servant in the house. C. Moses was a servant in God’s house, while Christ was actually God’s Son. Who has a higher position, Son or servant? 6. We are this house. We are the body of Christ. See cross-references. Christ has brought us by adoption into the very household of God. Signs of being in this house include holding fast and keeping firm in our hope until the end. Some may appear for awhile to be part of the house, but then fall away. True members of God’s family will never fall away. What does it mean to you that you are part of God’s own household? What should you do because of this? Why does the author say that this passage (from Psalms) was authored by the Holy Spirit? What does this tell us about the authority and inspiration of Scripture? What does it mean to “harden your heart”? In what way did they provoke God? How were they testing God? What kind of “works” or miracles did they see that God did for the forty years they were in the wilderness? Did these convince them? Why or why not? Why could they not enter into the Promised Land (My rest)? What does this tell us about God’s nature and the consequences of sin? Psalms 95:7-11 – This passage is quoted from there. Psalms 78:40-53 – The people didn’t follow Him even after God had done so many miracles in their presence. 1. Just as the Holy Spirit says – This passage is quoted from Psalms 95. We are not 100% sure who authored it, but many believe David did. Yet here the writer asribes these words to the Holy Spirit. Why? It doesn’t matter who the human author is. All of Scripture is inspired by God. The Holy Spirit moved people to write down God’s message. The human writer was the tool the Holy Spirit used to bring God’s message to the people. This is another reminder that all of Scripture is God’s words and not mere human’s own opinions. In the beginning of chapter one we noted that we cannot comprehend God on our own. Only if He reveals Himself to us, can we understand His character and plan. Because He did reveal Himself to us and has given us His message, we must PAY ATTENTION to it and study it! 2. The author first quotes this passage from Psalms 95 about the failures of the Israelites in the Old Testament and then will go on to exposit thsse verses making points and applications from them. Notice that in the coming passages he reviews these verses sometimes more than once. MacArthur says that he makes a 3 point exposition of this passage: firstly, “beware of unbelief (12-19), secondly, “be afraid of falling short (4:1-10), thirdly, “be diligent to enter (4:11-13). 3. Let’s review the history together of what happened during the 40 years in the wilderness. What did those 40 years teach us about people? What did they teach us about God? Is there an example that should be avoided? What can we learn from what those people did that can be applied to our lives today? What consequences did they face for their unbelief and disobedience? In what ways might an unbelieving heart manifest itself? How can we increase our belief/faith in God? What can we do to help others not fall away? What specific things can you to encourage others? In what ways would you like other people to encourage you? What does it mean that we are partakers of Christ? Why do you think the author talks so many times about holding fast? What happened to the people who provoked God? Do you remember what happened when they first commanded to enter into the Promised Land? What then happened when they tried to enter by their own strength? Jeremiah 17:9 – Our heart is deceitful and desperately wicked. 1. Take care not to have an evil, unbelieving heart – The first two words of this verse are very important. In every area of our Christian life we should take care. That means we should watch ourselves. We should continually evaluate ourselves. If there are any sins or sinful tendencies we must confess them quickly before they can grow and spread. Sin is like a cancer and must be cut out mercilessly. Believers could not actually have this type of unregenerate heart. The problem is that within a typical church meeting there would be a number of people who appear to be following God on the outside, but their hearts do not belong to God. Whoever, professes to be a believer must guard against this. We discussed in a previous passage that it could be easy drift away from God. Believers who are walking faithfully with God wouldn’t typically wake up one day and then decide to commit heinous sins. It is often a gradual process. When can unbelief sneak in? a) Not getting what we want in prayer – We approach God with a demand in prayer. We do not receive it and grow upset that God hasn’t given us what we want and start to doubt Him. b) Facing a difficult trial – When facing a trial some would begin to doubt God’s goodness and/or sovereignty. If a loved one has died or they have lost their job or face a painful health problem, a person may slowly grow bitter against God, which would cause them to fall away from Him. c) Not keeping a close relationship with Him – If we are just doing the actions without renewing our mind and heart, unbelief can creep in. 2. We have a responsibility to help other brothers and sisters not to fall away from God. What is it? God has called us to encourage others day by day (daily). This is something we should be doing regularly as a lifestyle, not just now and then. God knows our hearts inclination toward sin. He knows the struggles we face and He knows that if we are on our own, the liklihood that we will fall into sin is much greater. In His great love and mercy He has provided a large Christian family for us. He has provided fellowship with brothers and sisters in Christ so that we can be a safety net, a motivator, accountability partners, prayer partners, etc. What are some specific things we can do to encourage others in their relationship with Christ? a) Phone calls – Sometimes just seeing a person one time a week during study or church is not enough. Time is limited and we didn’t have a lot of time outside of the study to really get to know what is going on in his/her life. Picking up the phone is a great way to learn more about the real life issues others are facing as well as how we can pray for and help them. b) Face to face meetings – Invite people to your home for meals. Invite your friends out for tea or a meal. Invite other believers out to do sports or exercise together. e) During these meetings go deeper in your conversations. Share what you have been learning in the Word. Share prayer requests. Share struggles and victories. Don’t just talk about the weather and how busy you are at work. 3. We are partakers of Christ – Jesus said that His disciples needed to actually eat His flesh. This was an illustration for the total commitment we need and that we must totally rely on Him. We can not be His disciple unless we completely identify with Him, making Him the Lord of our life. It is not acceptable to live our life the same way we did in the past while adding in a 20 minute praise session per week saying how much we love Christ. We need to imitate His character and learn from His example. 4. Provoking God – Sometimes we thought of God as a far away being without much contact with or care about what is going on in the world. When we view God like this, we would be tempted to think that He doesn’t care much about our sins (and some might go so far as to think He didn’t even see it as Proverbs says, “A fool says in his heart, ‘there is no God.’” We need to realize that our sin provokes God. Like we learned in the book of Ezra, it rises up like a stench to God’s throne room in heaven. It is grossly offensive to Him. 5. The consequences of sin – Don’t be fooled. God sees our sin. How does He react to it? Verse 17 shows that it makes Him angry. This is the righteous anger because of His holy nature. The people who provoked God with their sins in the wilderness wandered in it for forty years before dying without ever seeing the promised land. Their sin came with a high cost. 6. In these verses the implication is that just as those people who provoked God could not enter into the land of rest (the promised land), if we follow their example in provoking God, we could not enter into His rest (heaven) either. Don’t think that our fate will be different than theirs. If you have any sinful habits, know that continuing in them is just provoking God. He sees and we will also face the consequences. Application: What did you learn in this passage that you need to obey in the coming week?